The MLB playoffs are stupid. That being said, I’m going to watch every game because the playoffs are awesome. Let me clear things up a bit. The playoffs are awesome. The structure of the playoffs is stupid. Let’s start with the dumbest of all: the one game playoff. Nothing in baseball (with the reasonable exception of regular season ties) is settled in one game. And yet, we have a one game playoff for some reason (money). Next we have this 5 game divisional series. This isn’t nearly as bad as the one game playoff (which is probably the dumbest thing in all playoffs of all sports). However, my problem with the divisional series isn’t the length (though 7 games would be better), it’s that they don’t seed. The top team (i.e. most regular season wins) plays the winner of the wild card game. That’s how you end up with the Cardinals and the Cubs, arguably the two best teams in baseball this year, playing each other in the divisional series. These two teams shouldn’t meet until the NLCS. That would be an awesome series. The Cubs might not win the World Series, but getting to play the Cardinals in the NLDS is the best they can hope for. BUT……If you’re a Cubs fan, the playoffs are absolutely IDEAL for the cubs. Let’s go ahead and make some assumptions and we’ll see why. Let’s assume that the number of wins during the regular season is a reasonable measure of how good a team is. If that’s the case, then the three best teams in baseball are the Cardinals, Pirates, and Cubs, in that order. So under this assumption, the only teams in baseball that were better than the Cubs were the Cardinals and the Pirates. Now think about this: If you want to beat a team that is better than you (i.e. will win more than 50% of the time in an infinite number of games), would you rather play them in a long series or a short series? The answer is a short series. And that’s exactly what the Cubs get. They play the Pirates in a one game playoff and they get the Cardinals (i.e. the “best” team in baseball in a five game series). It’s all falling Cubs. Let’s do a simulation to see how much of an advantage this is. For the simulation (this is going to be a really simple simulation) we’re going to assume that in each series the the probability that team A beats team B is the same for each game. So we need to define four probabilities to assess the probability that the Cubs win the World Series, one of reach round of the playoffs. Let’s start by assuming that the Cubs have a 0.5 probability of beating every playoff team in baseball in one game except the Cardinals. And we’ll let the probability that the Cubs beat the Cardinals vary between 0 and 1. Then we’ll compare the odds that the Cubs win the World Series is they played the Cardinals in the NLDS (as in reality) versus the odds of winning the World Series if they played the Cardinals in the NLCS. If the probability that the Cubs beat the Cardinals in 0.5, it doesn’t matter when the Cubs play them (i.e the odds ratio is 1). However, if the Cubs are less than 0.5 to win each game the advantage grows quickly. If the probability that the Cubs beat the Cardinals is 0.25 (very unrealistic), the Cubs odds of winning the World Series increase by about 45% because the get to play the Cardinals in the division series. If the Cubs have a 0.4 probability of winning each game against the Cardinals, they have about a 10% increase in the odds of winning with World Series and at a 0.45 probability of winning each game, their odds are increased by about 4%. 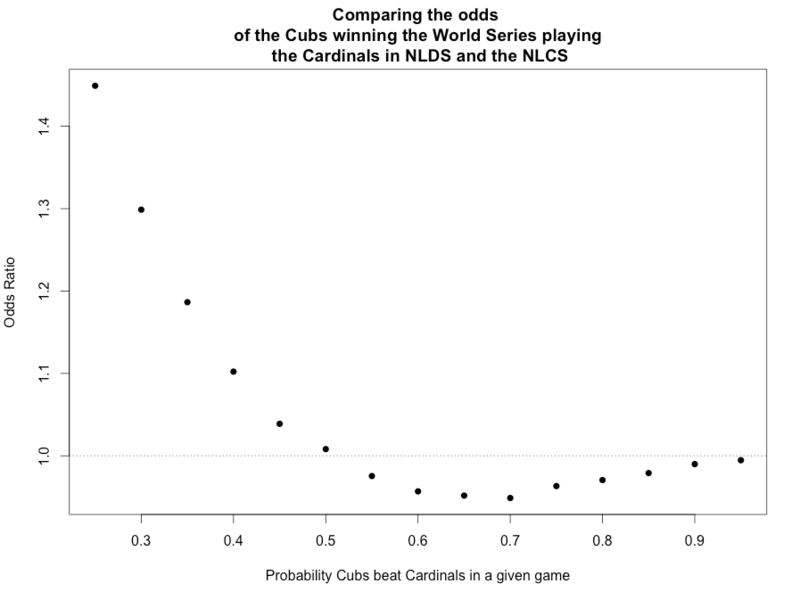 The plot below shows the probability of a Cubs win in each game over the Cardinals on the x-axis and the y-axis shows the odds ratio comparing the odds of the Cubs winning the World Series if they played the Cardinals in the NLDS as opposed to the NLCS. Posted on October 13, 2015, in Uncategorized. Bookmark the permalink. Leave a comment.